We provide various kinds of customized cup pads, it has different materials like PVC rubber and silicone rubber, you can according to the degree of hardness of to select appropriate cup pads. Except materials, the color, size and style are also different, all the designs depend on your preference. If you have any demands, you can contact to tell us at any time. 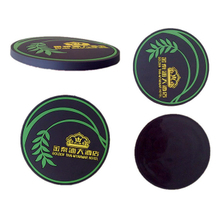 The surface of customized cup pads are easy to clean, heat stabile, tasteless. If you are looking for customized gifts for your employees, team members, customers, or for promotional gifts, our custom cup pads are good choice for you. Except the cup pads, we also have other beautiful, economical and practical custom pads, they are all good choice for you. We guarantee product quality, please rest assured to contact us about your really want,we must provide you high quality customized cup pads .